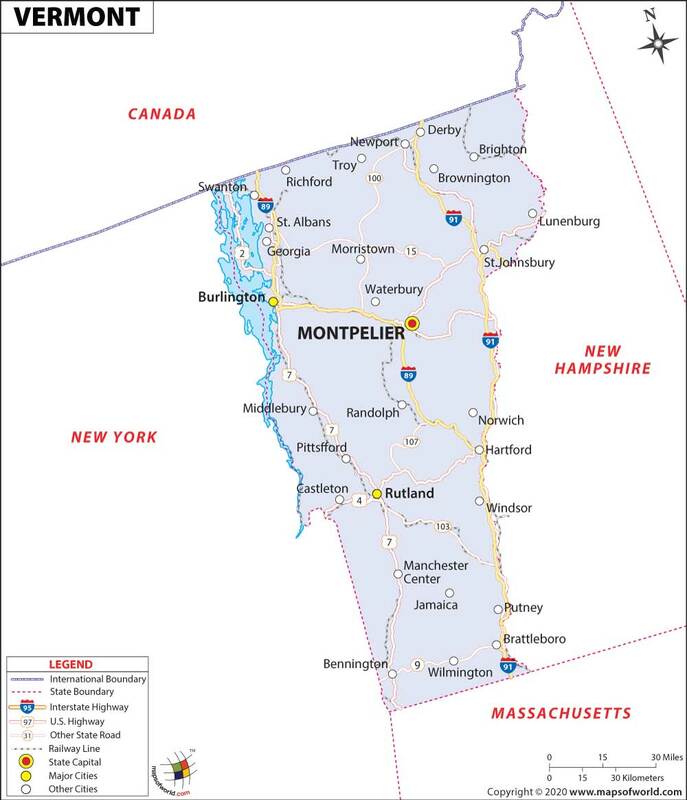 Vermont is the fifth-smallest state in the United States, covering an area of 9,615 square miles. The geographic center of the state is situated in the Washington County. The Green Mountains are within the state. No building in Vermont is taller than 38 meters. The area comprises by land and water in VT are 9,250 square miles and 365 square miles respectively. Killington Peak is the highest mountain in this state. Northeast Highlands: Lying in the northeast corner of Vermont, the Northeast Highlands extend to parts of New Hampshire and Maine. The region is composed of high granite mountains like the Gore Mountain, Burke Mountain and Mount Monadnock. Western New England Upland: The area stretching south to Massachusetts and Connecticut, is called the Western New England Upland. The region covers most of the eastern portion of the state. The region is distinguished by fertile lowlands. Green Mountains: Covering the central portion of the state, the Green Mountains region is covered by many mountains. The mountains have many mineral resources such as marble, granite, salt, slate and talc. Vermont Valley: The region covering the western part of the state of Vermont is known as the Vermont Valley. The area is a small strip of land composed of small rivers and river valleys. The major rivers in the region include the Baton Kill and Waloomsac river. Taconic Mountains: The area extending from Massachusetts to the southwestern Vermont, is a hilly area known as the Taconic Mountains. The region comprises mountains, rivers, and beautiful lakes. Equinox Mountain, Little Equinox Mountain, Mother Myrick Mountain and Bear Mountain lie are located in this region. Champlain Valley: Also called the Vermont Lowland, the Champlain Valley is a fertile valley bordering Lake Champlain. It is a fertile farmland known for its dairy farms, apple orchards, and fields of corn, hay, oats, and wheat. Vermont experiences a humid continental climate. The summers are generally warm and humid, while the winters are cold. The highest temperature recorded in the state was 41°C, at Vernon, on July 4, 1911; while the lowest recorded temperature was '46°C, at Bloomfield, on December 30, 1933. There is also occasional snowfall in the state and it is the seventh-coldest state in the United States.